Maxwell HS Chapter Leader Jeffrey Bernstein (with bullhorn) fires up the crowd at a pre-meeting rally. Hundreds of angry, chanting parents, students, educators and community activists rallied outside William H. Maxwell HS in East New York, Brooklyn, on Dec. 9, demanding that Mayor Michael Bloomberg rescind an order by Chancellor Joel Klein to “phase out” the school. In everyday parlance, “phase out” means closing the school, a nuance totally understood by everybody at the school. Maxwell, a career and technical education high school with a long history, is one of the city’s large high schools. The school is closing even though the Department of Education handed out $178,500 in bonuses to UFT members there this year and $384,000 last year because the school met its performance targets. “The department looks absolutely ridiculous to be closing the school after awarding bonuses,” Columbia University Professor Aaron Pallas observed. “It’s a bizarro world,” said UFT President Michael Mulgrew, when a school is closed as it’s moving forward. 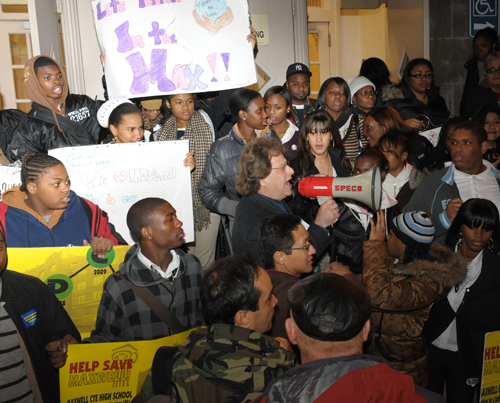 Later, at a meeting in the school auditorium called by the DOE to explain the decision to parents and the community, Brooklyn High School Superintendent Ainslie Cumberbatch, while claiming he had no power to stop the closing, made the startling admission that he wasn’t aware that the school was in need of additional support. He said that “no one called me” since May, when he visited the school for the first and only time, to tell him the school needed help. After Cumberbatch told the audience that “all of us at DOE have failed,” he informed a Maxwell junior that the students who had succeeded in getting their required career and technical education credits would be forced to take the same courses over again in a new school. In other words, successful students will bear the brunt of Chancellor Klein’s failure to “improve” the school. Among the community members who spoke out in support of the school was Gladys George, a Maxwell alumna who owns a hair salon in the community and is working on her Ph. D.
“I wouldn’t be where I am today if it hadn’t been for my teachers at Maxwell,” George said. “They inspired me and helped me set a career path and they were always encouraging.” She said she felt an obligation to attend the rally because the school is such an integral part of the community. Everett said that students like George are what Maxwell is all about. “I’m so proud of her,” she added. The DOE’s earlier shutdown of several neighboring high schools force-fed hundreds of displaced students into Maxwell, giving it the nickname of Sardine High and making it one of the most overcrowded schools in the city. The sudden influx included a high number of English-as-a-second-language students and many with no interest in the vocational offerings at the Brooklyn school, according to Chapter Leader Jeffrey Bernstein. Bernstein said the school got “zero support” in meeting the strains created by the new population. Despite those obstacles that the DOE put in its path, Bernstein said, the school has steadily improved. The school has made gains in all academic areas and doubled its graduation rate since moving off the state’s SURR list of failing schools three years ago. At Maxwell, the English Regents passing grades climbed from 70 percent to 89 percent over two years, as did scores for the Living Environment Regents, which rose from 51 percent to 84 percent. Scores on the Math A Regents leaped from 23 to 69 percent over the same period. Current and former students heaped praise on the UFT members who helped them along career paths and counseled them in times of need. Even Cumberbatch said the teachers are doing a good job. Cumberbatch told the New York Teacher that the new school will not be called Maxwell. William Maxwell, an educational reformer who became the first superintendent of the school system in 1898, believed in opening schools, not closing them. During his tenure, kindergarten was instituted and 20 high schools were built. “It is only through a high school education that the son of a poor man obtains an approach to equality with the son of a rich man in opportunity for success in life,” Maxwell said.